No matter when you go fly fishing, you have to bring warm clothes and accessories that make it easy to spend long periods of time outside. 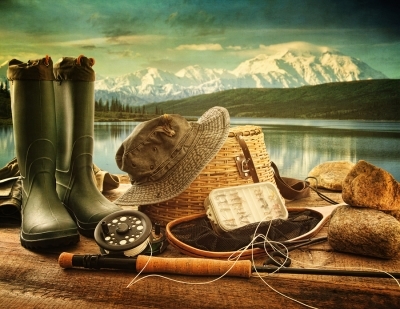 Even if you are fishing during the summer, you should have a polar fleece hat, a wool cap, and a wide-brimmed hat. Polarized sunglasses help you stare out over the water for long periods of time. Gloves, mittens, and quality rain gear allows you to continue fishing in any kind of weather. You should always have a warm jacket, plenty of socks, and a pair or two of long underwear. Fly-fishing gear gives you the edge you need to make the most of your next trip. Be sure to bring a comfortable pair of waterproof waders and wading boots. When you can keep your lower body dry and warm, you can spend more time out in the water. You might want to also invest in a mesh vest with plenty of pockets where you can keep your equipment . Your fly-fishing rod is probably the most important piece of gear that you will bring on your next fishing trip, so you should spend some time choosing the right one. Try out a few different styles until you find one that feels really comfortable in your hands. Use the reel a few times to make sure it works well in your hands. The right rod gives you an immediate edge for your next Montana fly-fishing trip.